The WISER operations team recently developed a mobile headwall unit. The unit was created in response to the need for a headwall that can be moved from location to location and function independently of standard gas connections. The unit can operate from wall gasses or independently with a compressor unit. The patient monitor and equipment has been installed on it as well. 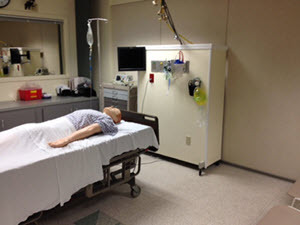 It is currently located in WISER's Simulation Room 11, where medical, nursing and other students utilize it daily.